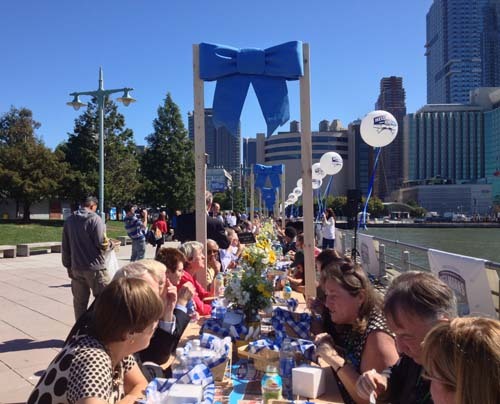 Hellmann's put together this long picnic table to break the world record, and celebrate their 100th birthday. Record-breaking has always been an effective PR gimmick; this one is no different. Hellmann's, perhaps the biggest mayonnaise brand on the market, decided to celebrate its 100th birthday by creating the world's longest picnic table. The brand, which was founded in New York City by Richard Hellmann in his deli, invited more than 400 people to participate in the world's largest picnic, as Mario Batali devised a menu that used cupcakes for everything: potato salad, pasta salad, a mini slider, and corn on the cob. For dessert, Magnolia Bakery turned out chocolate mayonnaise cupcakes (do not fear; we could not taste the mayonnaise). Check out scenes from the gathering below, as a Guinness World Record official did the official measuring of the table and named it the world's longest picnic table. Hellmann's had to break 305 feet and 3 inches, and the final measurement of the table was 320 feet and 2 inches. Attendees included Tim Love, Aarón Sanchez, Andy Cohen, Katie Holmes, Paul Pierce, and, of course, Batali himself, who jokingly noted that while he's never broken a Guinness World Record, "I have had a few pints of Guinness."